How To Build A Standout-in-the-Crowd Chest! Since the beginning of bodybuilding time, men have wanted to build a chest that enters the room a good 2 seconds before the rest of their body. They want a chest that stands out and commands attention, a chest that steps up and sticks out. A broad chest that women seek to lay their head upon. And ladies, too, seek a beautiful chest - one that accents their natural assets. But they also want their chest to be sleek and feminine like the rest of their physique at the same time. Well, achieving either of those goals is easily attainable with a thorough chest routine. And add a few expert tips and tricks into your overall plan, and you'll have the chest of your dreams without the shoulder injuries of your nightmares. Consider this new-era, Underground Bodybuilding Training. Shoulder injuries have always been the rain on the chest training parade. Injuries are often due to overtraining, improper form, or simply not applying a back training ying to the chest training yang. So when you do this routine, it will train your entire upper, upper body. By that I mean your chest, your rear delts, the rhomboids between your shoulder blades, your traps, and your rotator cuff muscles. From your ribs to your collarbone, at both the front and back of your body, your muscles will be exhausted, but trained to just the right level of exhaustion. 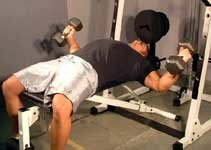 With just the right volume, but without overloading the shoulder joint, we are going to use basic chest exercises, but with a twist in a few cases, to make the most of the least. By training with supersets, you'll get in and out of the gym if you do only the 6 exercises below. Talk about a beautiful chest, fast! While the full program offers the optimal volume for mega-chest-mass, I've included some substitutions for women that are a little concerned with adding too much mass too fast to their chests. So make sure to read training substitutions, included below the workout, so you can customize the program to your goals. 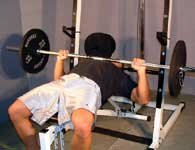 I've also included a summary of the methods, and a bonus instant chest building technique you would probably never think of, after the workout. As well, a complete set of exercise descriptions is included at the end of the article. Rest 60 seconds between exercises. Rest 90 seconds before repeating the superset. Do not rest between exercises. Rest 60 seconds before repeating the superset. Click Here For A Printable Log Of Standout Chest Routine. Do only 2 sets of each exercise. For exercise A1), substitute the maximum number of pushups you can do in place of the DB Flat Chest Press. Decrease the rest between supersets to only 30 seconds. Click Here For A Printable Log Of Female Substitutions. This is something that everyone should be doing, several times per day. If you work at a computer, you should be trying to hold this position all of the time. Here's what to do: In a seated or standing position, hold your arms down by your side. Externally rotate your shoulders so that your palms are now facing forward. Use the muscles between your shoulder blades to bring your shoulder blades together. 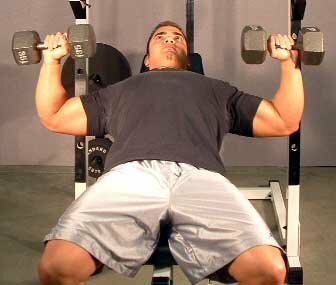 Squeeze extra hard and pull your shoulders back by contracting your rear delts. At the same time, try to pull your shoulders down (you might feel a stretch running along your neck between your shoulders and your ears - the more stretch you feel, the more you need to work on holding this position). This should pull your shoulders back and pop your chest out at least two inches. You should feel tension between your shoulder blades as your muscles work to hold that position. You might also feel a stretch in your chest. Now hold this proud posture as much as you can all day and when standing around in the clubs or in line at the grocery store. Trust me, someone will notice! Hold the dumbbells above your chest with your palms turned toward your feet. Lower the dumbbells to chest level. 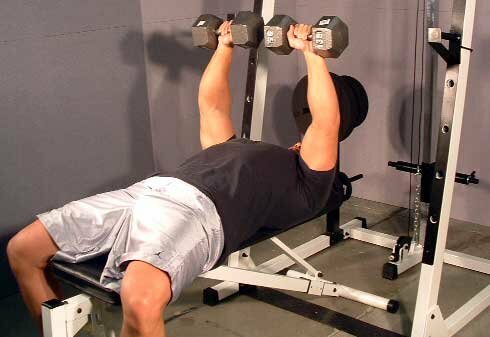 Press the dumbbells straight up above the chest. Stand with your torso bent and parallel to the floor. Contract your glutes, brace your abs and keep your spine in a neutral position. Keep the lower back in a neutral position and your knees slightly bent. Grasp the barbell with your hands slightly wider than shoulder-width apart. Row the barbell to the abdomen and bring your shoulder blades together. Slowly lower to the starting position and repeat. Do not round your lower back. Use a long bar and take a greater than shoulder-width overhand grip. Keep your arms and back straight, knees slightly bent. Row the handle back as far as possible bringing your shoulder blades together. Lie on a bench with the backrest inclined at 45 degrees. Hold the dumbbells above your chest with your palms turned toward your feet. 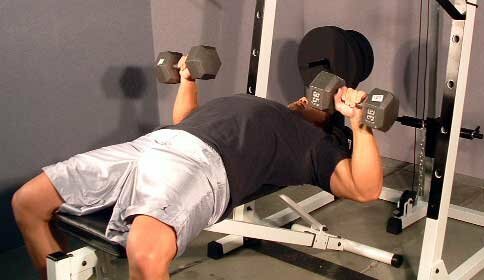 Lower the dumbbells to chest level. 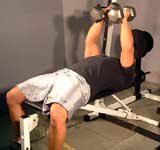 Press the dumbbells straight up above the chest. 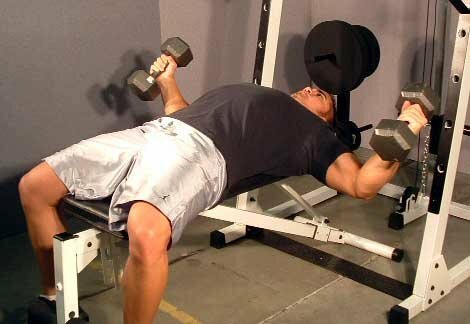 Lie flat on your back on a bench and hold the dumbbells with your palms turned towards your body (palms will face each other). Maintain a slight bend in your elbows at all times. Slowly begin to lower the dumbbells out to your side until your elbows reach shoulder level. Don't lower the dumbbells any further. 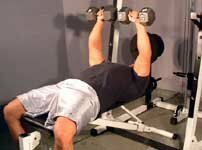 At this point, squeeze your chest and bring the dumbbells up and in to the start position under control. Keep your feet flat on the floor, legs bent, and upper back flat against the bench. 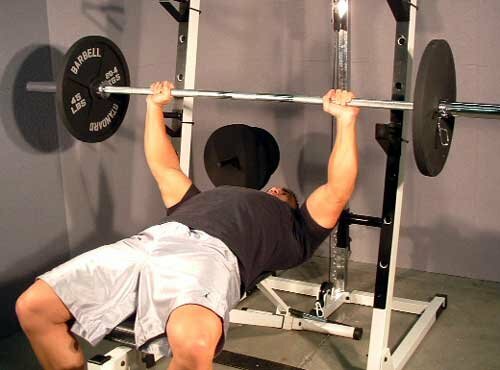 Grip the bar half-way between shoulder-width and your normal bench press grip. Keep the elbows close to the sides to emphasize the triceps. 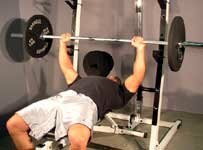 Have your spotter help you take the bar from the rack. Keeping your elbows close to your sides, lower the bar straight down to the bottom of your chest. Pause briefly and then press the bar back up above the chest in a straight line.